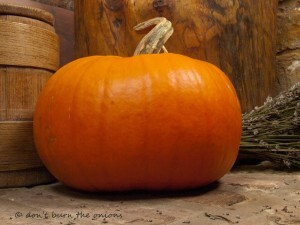 Pumpkins can be baked, cooked in soups or casseroles or simply boiled or steamed. They make a nutritious addition to vegetarian dishes and can be liquidised to a smooth pulp and used in savoury or sweet dishes. The flesh is a good natural thickener. 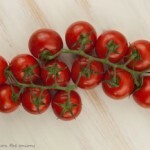 Shopping tip: The smaller ones tend to be more tender, fuller flavoured and easier to chop! 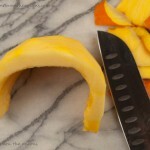 NB: You will need a large chopping knife as the pumpkin shell is very hard. 1. 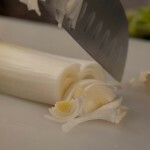 Cut out the stem section as this makes it easier to steady your knife and make your first downward incision. Then chop the required chunk or chop the rest of it into several large wedges, if using it all. 3. 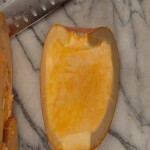 Placing pumpkin on its side, chop off the hard outer shell. 4. 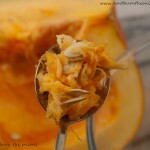 Pumpkin flesh is now ready to be chopped and added to your favourite recipe. 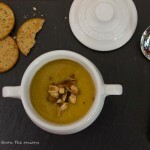 For inspiration, try clicking on following links: Baked Pumpkin, Rosemary and Almond soup, Eye Spy Pumpkin soup and Italian Minestra. 1 Chop pumpkin flesh into even sized cubes. Place in oven proof dish and coat in olive oil. Add a little salt if you wish and other flavourings, such as herbs. 2. 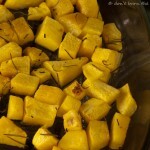 Roast for about 15 minutes in a hot oven (around 250F) or until the cubes have softened and caramelised. They are now ready to eat or can be added to vegetable soups for added sweetness. 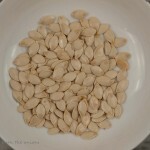 Wash pumpkin seeds in a colander under cold running water and remove membrane (the inner stringy pulp). Place in a pan of lightly, salted water and bring to the boil. Simmer for about 10 minutes. Remove from pan, sieve and pat dry. 2. Then you can toss in a little olive oil and season with salt for the simplest method or have fun with other flavourings such as adding freshly chopped rosemary and ground pink pepper corns (left pic) or whatever else takes your fancy! 3. 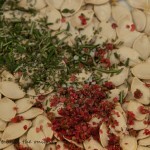 Spread seeds evenly on a baking tray and roast in a hot oven (around 300F) for about 10 minutes. 4. Take out of oven and move them around with spatula to make sure they cook evenly. Return to oven for about another 8-10 minutes. Take out again and check by testing whether cooked inside. Take care not to burn your mouth! The seeds will be hot as hell! 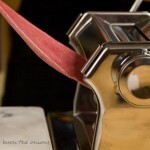 Cooking tip: The hotter your oven the quicker they will cook but they will also burn more easily. You want your seeds to be golden coloured and not brown. 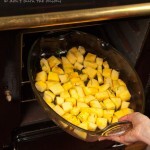 5.Once cooked remove from oven and make sure seeds have cooled down before eating. Check snapguide in Meals in Minutes for a picture guide and Glossary for further info on why pumpkins are so good for you-especially when it’s chilly!